One of my goals for this year is to try and find some new ideas for my kids lunches and at the same time encourage my kids to eat some more/different fruits/veggies than they normally do. Nathan has never liked eating celery on it's own but really enjoyed this quick and easy snack. I used 1/2 cup of cream cheese (softened) and added 1 tsp of his favorite lemon dilly seasoning from Epicure. Since Karensa did not like this it looks like I am back to the drawing board for her. -Make a savory spread by adding own favorite herbs and mix in shredded carrots or other minced/shredded veggies. What are some tricks or tips you have used to get your kids to eat more fruits and vegetables? What a great idea to get celery into a kid! My daughter loves it but my son... I think he might like this. Thanks for the idea! 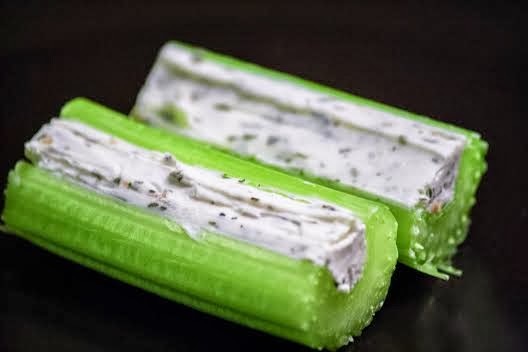 Cream cheese on celery is great! I also like the old school peanut butter on celery. I haven't tried either with my son yet. I think he finally has enough teeth that he could probably bit through raw celery, so I really should try. My tips/tricks would be to mix the veggies with something else or bake them into something. Mini quiches are great. If I cut any kind of leafy greens up really tiny and mix them with quinoa, rice, or another grain, my son will eat them. I've also made a "harvest" soup that had a ton of fall veggies in it, all pureed down. And I've baked cakes and bread with veggies in them.